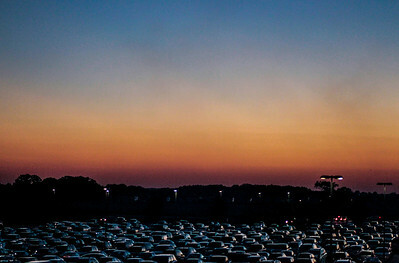 Kyle Grillot - kgrillot@shawmedia.com Cars fill the parking lot of Woodstock North High School before the start of the high school football game against Johnsburg Friday, September 27, 2013. 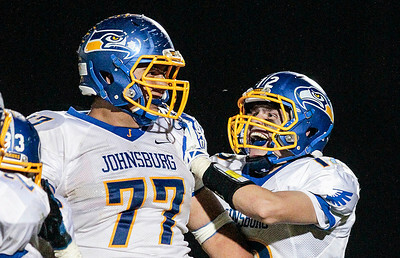 Johnsburg won the game, ending a 25 game losing streak. 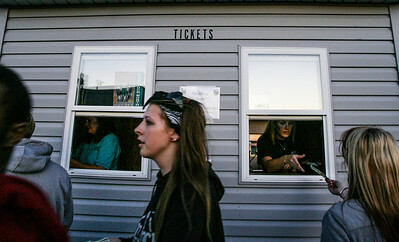 Kyle Grillot - kgrillot@shawmedia.com Spectators purchase tickets before the start of the high school football game at Woodstock North High School against Johnsburg Friday, September 27, 2013. 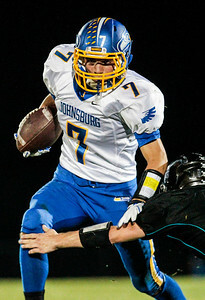 Johnsburg won the game, ending a 25 game losing streak. 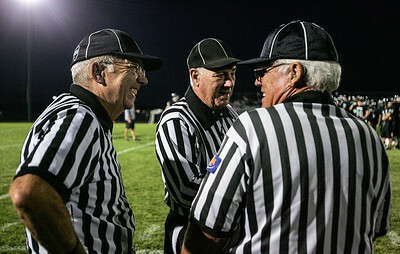 Kyle Grillot - kgrillot@shawmedia.com Referees talk before the start of the high school football game at Woodstock North High School against Johnsburg Friday, September 27, 2013. Johnsburg won the game, ending a 25 game losing streak. 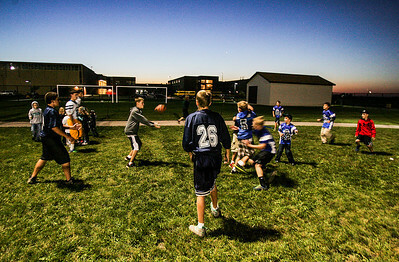 Kyle Grillot - kgrillot@shawmedia.com Kids pass a football next to the football field at at Woodstock North High School during the football game Friday, September 27, 2013. Johnsburg won the game, ending a 25 game losing streak. 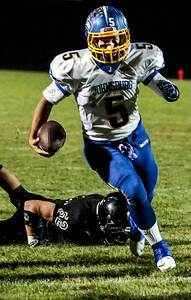 Kyle Grillot - kgrillot@shawmedia.com Johnsburg junior quarterback Nick Brengman runs the ball in for a touchdown during the third quarter of the high school football game at Woodstock North High School Friday, September 27, 2013. 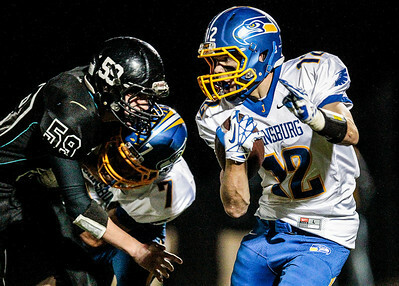 Johnsburg won the game, ending a 25 game losing streak. 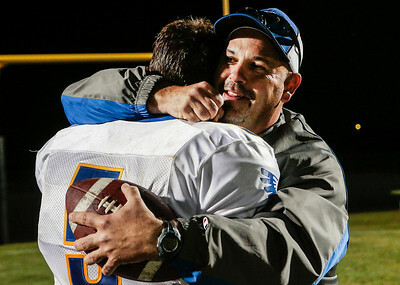 Kyle Grillot - kgrillot@shawmedia.com Johnsburg junior quarterback Nick Brengman hugs Dan Stefka, father of junior Bailey Stefka after winning the high school football game against Woodstock North High School Friday, September 27, 2013. Johnsburg won the game, ending a 25 game losing streak. 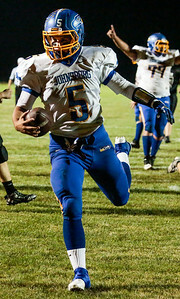 Kyle Grillot - kgrillot@shawmedia.com Johnsburg senior Alec Graef runs past the Woodstock North defense during the quarter of high school football game at Woodstock North High School Friday, September 27, 2013. Johnsburg won the game, ending a 25 game losing streak. Kyle Grillot - kgrillot@shawmedia.com Johnsburg senior Steve Dixon (2) celebrates with a member of the coaching staff after running the ball in for a touchdown in the during thesecond quarter of the high school football game at Woodstock North High School Friday, September 27, 2013. Johnsburg won the game, ending a 25 game losing streak. 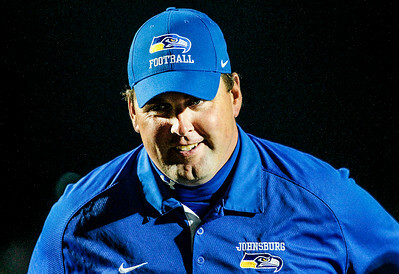 Kyle Grillot - kgrillot@shawmedia.com Johnsburg head coach Mike Maloney smiles while talking with his team after winning the high school football game at Woodstock North High School Friday, September 27, 2013. Johnsburg won the game, ending a 25 game losing streak. 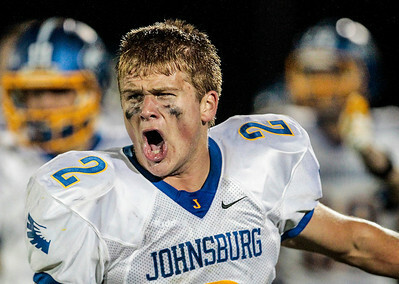 Kyle Grillot - kgrillot@shawmedia.com Johnsburg senior Steve Dixon (2) cheers on his team during the second quarter of the high school football game at Woodstock North High School Friday, September 27, 2013. Johnsburg won the game, ending a 25 game losing streak. 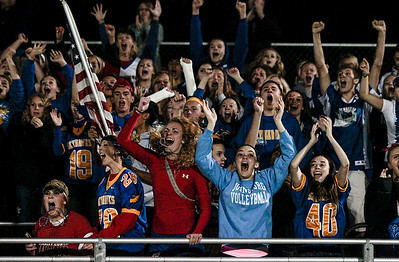 Kyle Grillot - kgrillot@shawmedia.com Johnsburg fans celebrate after Brad Iverson makes the game-ending interception during the fourth quarter of the high school football game at Woodstock North High School Friday, September 27, 2013. Johnsburg won the game, ending a 25 game losing streak. Kyle Grillot - kgrillot@shawmedia.com Johnsburg senior Steve Dixon (2) takes a drink of water during the second quarter of the high school football game at Woodstock North High School Friday, September 27, 2013. Johnsburg won the game, ending a 25 game losing streak. 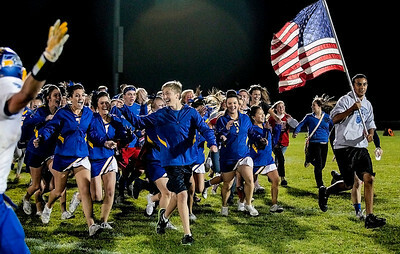 Kyle Grillot - kgrillot@shawmedia.com Johnsburg fans rush onto the field after the high school football game at Woodstock North High School Friday, September 27, 2013. Johnsburg won the game, ending a 25 game losing streak. Kyle Grillot - kgrillot@shawmedia.com Johnsburg senior Zach Kinney (77) is greeted by junior Brad Iverson after Kinney intercepted a ball late in the fourth quarter of the high school football game at Woodstock North High School Friday, September 27, 2013. Johnsburg won the game, ending a 25 game losing streak. 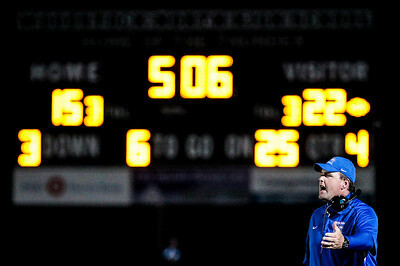 Kyle Grillot - kgrillot@shawmedia.com Johnsburg head coach Mike Maloney yells towards officials during the final minutes of the fourth quarter of the high school football game at Woodstock North High School Friday, September 27, 2013. Johnsburg won the game, ending a 25 game losing streak. Kyle Grillot - kgrillot@shawmedia.com Woodstock North junior Jimmy Krenger ruins the ball during the fourth quarter of the high school football game at Woodstock North High School Friday, September 27, 2013. Johnsburg won the game, ending a 25 game losing streak. 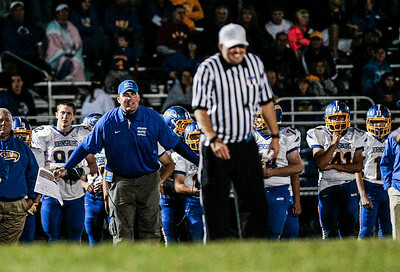 Kyle Grillot - kgrillot@shawmedia.com A referee smiles as Johnsburg head coach Mike Maloney yells about a call on a play during the third quarter of the high school football game at Woodstock North High School Friday, September 27, 2013. Johnsburg won the game, ending a 25 game losing streak. 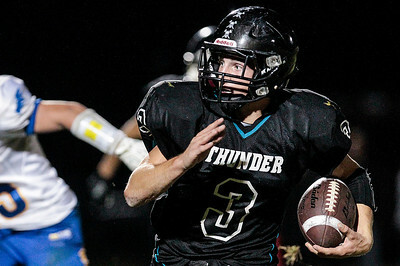 Kyle Grillot - kgrillot@shawmedia.com Johnsburg senior Alec Graef watches as a ball flies towards him during the second quarter of high school football game at Woodstock North High School Friday, September 27, 2013. Johnsburg won the game, ending a 25 game losing streak. 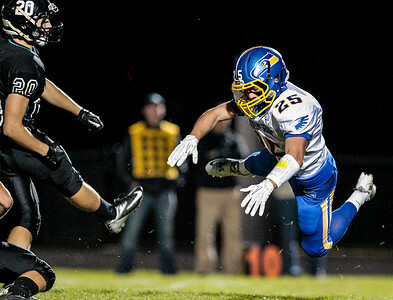 Kyle Grillot - kgrillot@shawmedia.com Johnsburg junior Branden Peshek dives for a field goal attempt during the first quarter of the high school football game at Woodstock North High School Friday, September 27, 2013. Johnsburg won the game, ending a 25 game losing streak. 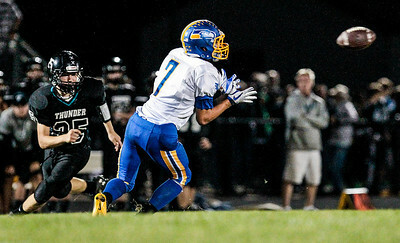 Kyle Grillot - kgrillot@shawmedia.com Johnsburg junior Brad Iverson (12) runs the ball in the firstquarter of the high school football game at Woodstock North High School Friday, September 27, 2013. Johnsburg won the game, ending a 25 game losing streak. 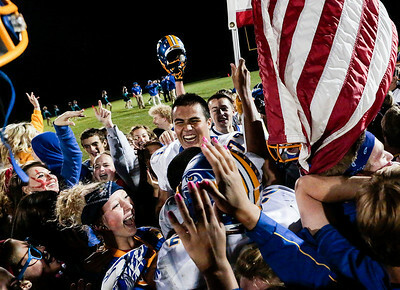 Kyle Grillot - kgrillot@shawmedia.com Johnsburg senior Steve Dixon (2) is greeted by fans after winning the high school football game against Woodstock North High School Friday, September 27, 2013. Johnsburg won the game, ending a 25 game losing streak. 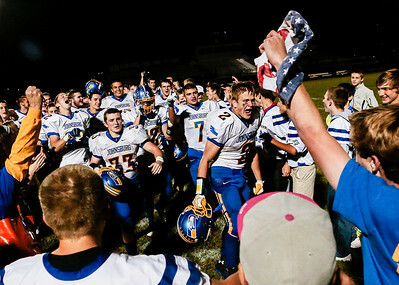 Kyle Grillot - kgrillot@shawmedia.com The Johnsburg team celebrates with fans after winning the high school football game at Woodstock North High School Friday, September 27, 2013. Johnsburg won the game, ending a 25 game losing streak. 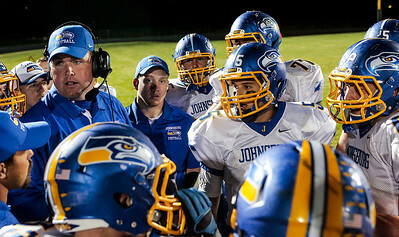 Kyle Grillot - kgrillot@shawmedia.com The Johnsburg team listens to head coach Mike Maloney after winning the high school football game at Woodstock North High School Friday, September 27, 2013. Johnsburg won the game, ending a 25 game losing streak. Kyle Grillot - kgrillot@shawmedia.com Johnsburg head coach Mike Maloney talks with his team after winning the high school football game at Woodstock North High School Friday, September 27, 2013. Johnsburg won the game, ending a 25 game losing streak. 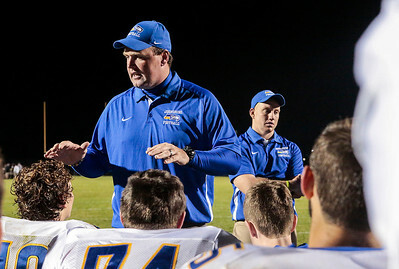 Kyle Grillot - kgrillot@shawmedia.com Johnsburg head coach Mike Maloney talks with his team during the third quarter of the high school football game at Woodstock North High School Friday, September 27, 2013. Johnsburg won the game, ending a 25 game losing streak. Kyle Grillot - kgrillot@shawmedia.com Johnsburg senior Steven Dixon (2) and Sophomore Anthony Vallone (31) watch the their tema in the final minutes of the high school football game at Woodstock North High School Friday, September 27, 2013. Johnsburg won the game, ending a 25 game losing streak. 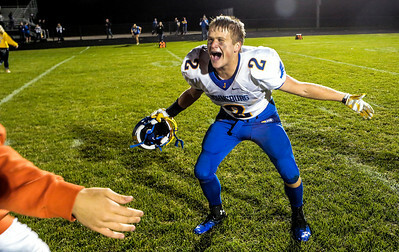 Johnsburg senior Steve Dixon (2) cheers on his team during the second quarter of the high school football game at Woodstock North High School Friday, September 27, 2013. 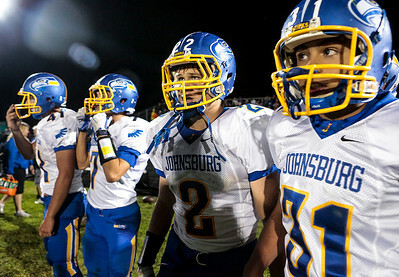 Johnsburg won the game, ending a 25 game losing streak.